These photographs from the Carolina Room's Charlotte Observer negatives offer a cheery glimpse of the community's second annual St. Patrick's Day parade held on Saturday, March 16, 1957. 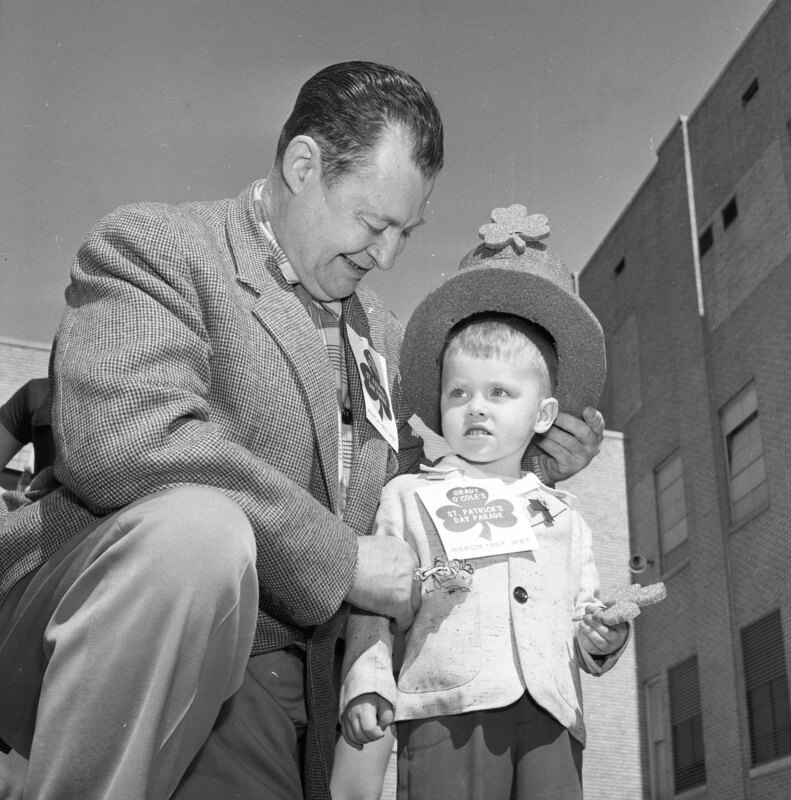 An annual parade was started in 1956 by WBT Radio personality Grady Cole and Kays Gary, the Charlotte Observer columnist. Parades were held each year until the 1960s. The annual event was revived by the Central Charlotte Association in the 1970s and continued through to 1992. Parades and festivals noting St. Patrick's Day have varied from year to year since then, but the community continues to celebrate. "'Twas a Great Day for The Irish of All Nationalities,” according to the headline of the article by Kays Gary and Don Oberdorfer that appeared on the front of the Charlotte Observer on Sunday, March 17, 1957. Marchers included Harry Golden and Grady Cole. Golden, editor of the Carolina Israelite, said that he marched "in memory of my sons, on their mother's side descendants of Irish Kings." The Marine Corps color guard led parading citizenry. Ragtag and organized bands led onlookers in many rounds of "When Irish Eyes are Smiling." Onlookers like these nuns waved shamrocks in greeting as the parade passed them. Cars and pedestrians made their way down South Tryon Street. Gary and Oberdorfer reported that men, women and children of all creeds and colors marched alongside each other. Bands represented both all-white Harding and all-black Second Ward High Schools. When the parade began in front of The Observer's South Tryon Street building, Grady Cole explained its purpose: "God put all kinds on this earth. Foolish to argue with Him. Might as well get along and like it." Many convertibles bore riding princes and princesses like this unidentified young woman. Only Green Lights Would Do! Grady Cole passed shamrocks and lapel cards out to the men and green carnations out to the women. The Observer reported that he stopped the parade at every red light, much to the consternation of police and the glee of crowds. "Man, he cried, "you can't ask an Irishman to go through a red light!" These youngsters enjoyed the beautiful day. The Observer reported the weather was sunny with a high of 72.